1. I’m still a little surprised that of all the media stories written about the Westside Subway Extension’s route, almost no attention was paid to the issue that there will be little or no parking provided by Metro at the stations. There will certainly be a lot of connecting bus service, bike racks and drop-off zones for subway riders, as well as some private lots for cars that are near the route. But this is still auto-centric Southern California and parking is almost always an issue when it comes to development. Readers of this blog don’t seem to think it’s much of an issue, judging from our own poll. And I personally don’t believe it’s a big deal — the current subway doesn’t have much parking from Metro. Still, I think it’s interesting that the media didn’t show much interest. 2. I think that something routinely overlooked in the debate over high-speed rail and whether it should be built at great cost in California is this: there are still large swaths of the state with little or no passenger rail service. In the year 2010, it’s not possible to take a train from Los Angeles to Bakersfield — Amtrak only offers bus service. Or from Bakersfield to Sacramento. Both of those trips require the Amtrak bus to complete them. And there are still considerable stretches of single-track in the state — meaning that service between Los Angeles and San Diego is slower than it should be, for example (it takes about 2 hours, 45 minutes each way). Don’t get me wrong. I think bullet trains would ultimately be great for California. But we’re building rail from the ground up. 3. The debate over whether to put a rush hour bus lane on Wilshire Boulevard’s Condo Canyon stretch in Wilshire, to me, is a good example of the biggest challenge facing bus lane projects in the U.S. Many transit officials, experts and advocates want to see more lanes — they’re a lot cheaper than building rail — but I think taking lanes from private vehicles and giving them to transit will be an uphill battle here and in much of the country. The idea of a lane sitting empty except for buses isn’t going to go down easy. Then again, there was a time when carpool lanes were controversial, too. 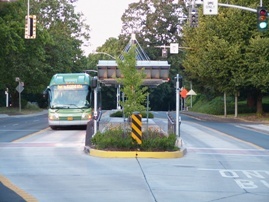 A center bus lane in Eugene, Oregon. Photo credit: www.gobrt.org. 4. As for the Wilshire bus lane, the policy question I’m most interested in is the wisdom of using the righthand parking or traffic lane versus the center lane. Of course, using a center lane means saying goodbye to left turns, which undoubtedly would inconvenience some people — and possibly would require buses with left-side doors for boarding. It would almost certainly be more expensive because of the need to construct bus stops in the middle of the street. On the other hand, using the right lane means having to share with private vehicles that want to turn right and waiting for those vehicles to turn because there are pedestrians in the crosswalk. Here’s some pics of a center-lane bus lane in Eugene, OR — and yes, I know Eugene is a wee bit smaller than L.A.! 5. I just spent a week in my hometown of Cincinnati and it reaffirmed for me (once again) that for all the griping about traffic in the L.A. area, there are a lot of other places who are as equally tethered — if not more so — to the private automobile than L.A. County. The city of Cincy is a small part of a two-million plus metro area. While there’s decent bus service in Cincy, the rest of the area in the past 20 years has sprawled outward into surrounding counties with little transit service — and a willingness to encourage the most auto-dependent forms of suburban sprawl. It’s little wonder then that the most pedestrian-oriented districts in the Cincy area are the giant suburban indoor shopping malls in the ‘burbs. As for the stats, Hamilton County, Ohio, has about 5.3 percent of its population taking transit to work versus 7.2 percent in L.A. County, according to the Census Bureau’s most recent fact sheets (Here’s Hamilton County’s and here’s L.A. County’s). More people carpool in L.A. County (11.5 percent to 8.3 percent), walked to work (2.9 percent to 2.7 percent), worked at home (4.3 percent to 3.3 percent) and got to work by other means — i.e. biking, etc. (2.1 percent to .8 percent). In Hamilton County, 79.7 percent of all workers drive alone to work, compared to 72.1 percent here. Hamilton County has one advantage — average commute time is 22 minutes there compared to 29 minutes here. Think the things I’m thinking about transportation are wrong, dumb, biased and/or lack reasoning, coherent thought and good morals? Leave a comment! If we require parking at stations, we’ll keep the stigma of an auto-centric neighborhood. Metro helps alleviate that problem and let’s us know there are alternatives to driving. If we keep up with the parking, streets would have to be widened, more left turn/right turn lanes, more traffic (more cars on street), which will make streets less safer for pedestrians and bicyclists. Metro rail is a significant turning point and certain areas are dense enough where no parking is needed (Rodeo, Fairfax, Century City, Westwood). Let’s keep it that way and let’s promote how stations can be accessed by buses and bikes. Note: The San Joaquins do provide direct rail service from Bakersfield to Sacramento. Four daily round-trips run Bakersfield-Oakland and two daily round-trips run Bakersfield-Sacramento. One thing that is also never mentioned in the press (or the site) is the benefit a comprehensive rapid-transit system would have on tourism. LA is known the world over as being difficult to get around. It is also one of the American locations tourists would like to visit most – since they are familiar with the movies, TV shows, etc.. It’ the same story from American tourists as well, they would like to visit but they do not want to rent a car and face these freeways and the gridlock. Just think about how many more tourists there would be if they could stay in Hollywood (or downtown) and take the subway to the beach (not Westwood…THE BEACH!!!) And tourist money is the best kind of local stimulus. The jobs they bring cannot be outsourced. And Hotel taxes are politically appealing. The tourists will be able to take the train to the beach in less than 5 years, when the Expo Line is finished. It’s already paid for, and Phase 2 construction is gong to start soon. Phase 1 (or at least part of it) will be running in less than one year. Thank you for bringing up the point about tourism!!! It is seriously way overlooked in importance given that this city is very tourism heavy (especially in the summer, hence the summer traffic which my Midwestern relatives did not know what that was and they are from Chicago LOL). But really, it is a huge part of the movement of people in this city, probably more than most American cities. This should have been thought about when considering the West Hollywood spur and, of course, to downtown Santa Monica. So, I agree with everything you said. The revenue, the attractiveness, everything. This needs to be discussed a lot more seeing as how transit is already a large means for tourists to get around many other cities. I for one do lament the lack of parking. The Westside is the common thread that runs through the opposition of the Expo line, subway or Wilshire bus only peak hour lanes. Areas that have a educated population with higher incomes are not interested in taking mass transit in general and also they may not want the area where they live developed. People fear that if the peak hour bus only lanes are put in on Wilshire Blvd it will cause more car congestion. But if the bus only lanes are not put in the congestion will increase over time from more cars being added. Potentially more people can be transported through that corridor by implementing bus only lanes compared to the current mixed use setup. That being said, there is another alternative for mass transit in the densely populated areas of L.A. and that is bicycle sharing. Modern bicycle sharing is a short term one way rental from one kiosk to another. Paris, Barcelona, Montreal, Dublin all have wildly successful bike share schemes with each one having tens of thousands of annual memberships. London and New York City both believe that they can make a profit on a bicycle sharing program. London has had a 6,000 bicycle share program in operation for four months and there is already 100,000 annual members with a expansion to 8,000 bicycles coming in 2012. New York City’s planning department has calculated that the city could use up to 49,000 bikes for hire and judging by other rental programs could have an average daily use of 500,000 trips a day. New York City plans to have a bicycle sharing program in place by the spring of 2012 and it will cost the city zero to implement. A bicycle share program for Los Angeles is potentially also cost free to the city and it can be implemented in a matter of months. Thanks for the comment. You’ve inspired me to write a story about how Metro could potentially interface with bike sharing. Off the top of my head, it seems like it would make a ton of sense to have a bike-share facility at the future Westwood subway station and another up at UCLA to help with the last mile connections. Heck, there’s enough transit ridership on Wilshire right now with the 720/20/BBB2 that you could do it. Part of the effort would be getting LADOT on the same page to roll out more bike infrastructure in the streets on the Westside at the same time to improve the biking experience, particularly when it comes to safety. Both metro people and transit advocates keep talking about the great cost of these rail projects. Is that really a fare characterization? Measure R provide $14 billion over 30 YEARS. LA is the second largest metro area in a country with an income of around $14 Trillion per YEAR, and in a state with a $1.8 Trillion per year income. LA county must be close to $800 Billion per year. I would like to see a story comparing the real costs of past infrastructure projects adjusted, both for inflation, and our increased real per capita income. Like this new feature, thanks! You raise a good point and you’re right about the numbers. According to Wikipedia (so take it with a grain of salt), LA County has a GDP of $792 billion, which means that if it were a US state, it would have the fourth largest economy after California, Texas, and New York. Off the top of my head, I can’t speak to the cost of infrastructure projects now versus, say, fifty years ago. That said, I have read that the amount of US GDP spent on infrastructure (presently about 2%) is half of what it was in the 1960s and is today about half of what Europe spends, not to mention China which I think is at around 9%. I’ve also read that it would cost as much, if not substantially more, to expand California’s airports to accommodate projected travel growth as it would to build out the high speed rail network. Each one is around $40 billion. So it’s not so much an issue of “if” you spend the money, but how and where. For my dollar, I’d rather see it go towards an electrified, low-carbon rail system than an expansion of the oil-intensive aviation system. The latter comes with oil’s frequent price shocks and geopolitical baggage. On top of that, with the new rail stations going in, municipalities will have the opportunity to really galvanize further investments in transit networks and transit oriented development. You can already see this happening with San Fran’s new Transbay Terminal and Anaheim’s Transit Center. I had no idea that public employees (outside of universities of course) had opinions. What could we possibly gain from the views of those who spend their lives working on policy issues? I also lament the lack of parking. It makes it much more attractive to just stay in my car and drive the full distance to my destination. Given the punctuality problems of many major MTA bus lines, anything beyond one transfer tends to make the trip much too unpredictable, time-wise. Given good weather, dedicated paths, and good health, including bicycling in the multi-modal mix can provide a reasonable alternative. Perhaps someday the private sector will find it profitable to provide pay parking near rail stations. Or perhaps MTA-run garages could pay for themselves. One of the keys elements needed for a successful bicycle sharing implementation is to have closely spaced bike rack kiosks that cover a large densely populated area. Targeting only a small geographic area will probably greatly lessen its success with a limited range of places to go and a increased cost per bicycle to implement. A large volume of bikes decreases the operations cost per bike, just like manufacturing in large volumes decreases the cost per item. Starting with 6,000bikes is a key factor on why London and New York City both believe that it’s possible to make money on a bike share program. To get a good background on how bicycle sharing works, I would suggest reading some of this exhaustive study that New York City’s Department of Planning put together in 2009. 2 things. Just 2 things, that would radically and immediately improve ease of use and increase ridership on the entire MTA system as its stands today and as we move forward with huge capitol improvements (for locals, tourists, and first timers). 1. Cash Purse on a readily available card (either TAP or temporary paper card). Have you ever been to Chicago put some money on your CTA card and used the system during your entire visit? Ever visited NY and put some money, day pass, weekend pass, or whatever on your metro card dispensed directly to you by a vending machine at the airport and then completely forgot about driving? Heck, have you ever visited Oakland and taken the AC Transit using one of their paper passes with either money or a transit pass on it? Part of the reason why the MTA is so difficult to take is all the thinking about fares, all the cash/change you have to carry on you, and finding the few places you can actually get a TAP or paper pass. All without a cash purse. Its incredible that this still happens in LA. One of the few metro areas left that doesn’t have a cash purse. Would anyone else like to chime in on this? Am I crazy to think these two items are simply the two of the most important, yet uncovered things for metro? We recently posted that Metro staff are saying the cash purse is coming next year. And in September, Metro’s Board approved a contract with NextBus for a real-time arrival system. GREAT! That’s great. I hope they do a huge PR campaign and get the word out! This will drastically improve the system. I cant wait! Thanks so much for updating on that. How would tourists take the Expo line to the beach if they are staying in Hollywood? Take the redline to downtown then get on the Expo line? you know how long that would take? Don’t you think there are a lot more interesting things to see, places to go along the subway route than the Expo line? What will end up happening is tourists will get off at Westwood, stroll the village, then take a bus to the beach. Not ideal, but far faster than taking the Expo line. While I look forward to the Expo line, it’s route is not exactly a convenient nor efficient way to the beach. South of the 10 vs Wilshire corridor (to the beach) = two completely different worlds, both deserving of rail transit. 1.Don’t hold your breath for rail from LA to Bakersfield, unless someone wants to cut a very long (seismic-tolerant) tunnel (similar to Alps?). The existing path LA to Mojave and Mojave to Bakersfield probably can’t be improved on; ok for freight but not people, can’t compete with motor vehicles over I5. 2.Santa Clarita Transit has TAP “cash purse” right now. I used it for a month in 3rd quarter 2010. But EZ-Pass is a better deal for both systems, so I use that now. Also, Burbank Bus no longer honors TAP, due to hardware installation costs and who pays for it. So TAP is a good idea in theory, but still has bugs to be worked out. Doesn’t seem to be user friendly for tourists, occasional users; where do you get the damn things? Seems like they should still be always available free on all buses or dispensed at rail stations. What is the card unit cost? Charging for them and making them inconvenient to obtain would discourage the occasional user / visitor from using public transit. If one can get a cell phone for $10, TAP cards should be more readily (cheaply) available. 3.Wilshire Rapid line 720 gets you to the beach right now. How much better can rail do? Is there any ROW left in the Wilshire Santa Monica Olympic Pico Venice Blvds corridor(s) to create a busway similar to Orange Line?